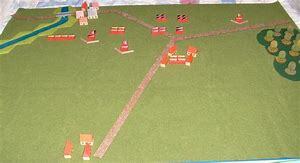 An earlier version of Command Decision and the Barbarossa 25 campaign supplement. As part of the 'Airfix generation' I have always been interested in WW2. I have fought many games of the years with land, sea and air featuring; from skirmishes up to full blown campaigns. The period is rich in gaming potential and lets be honest, there is a ton of material available to support the wargaming enthusiast from figures, models and books, not to mention a myriad of rule sets. So why try something different? What I want to do is not so much revolutionary as more evolutionary in concept. I want to fight a wide variety of table top wargames encompassing land, sea and air elements against the backdrop of WW2. This will mean games set in desert, the steppes of Russia, western Europe, the far East and the Pacific - on the ground, in the skies and at sea. I want to do this in a meaningful way so that the action relates to the map and how the war unfolds. In short the strategic situation will drive the tactical game - which is the essence of a campaign in any event. I am merely looking at the bigger picture. The forces I intend raising and using will be fairly modest as the main rules of choice will probably be the Portable Wargame as I believe these capture the spirit of what I am undertaking. Many years ago Frank Chadwick of GDW published a supplement to his Command Decision WW2 rules called Barbarossa 25. The idea behind this was that the armies and geography for the campaign in question were divided by 25 (as I recall, again, I stand to be corrected) so that realistic forces could be raised to refight the entire war on the Eastern Front. I believe he also did something similar for the Battle of the Bulge but I stand to be corrected should any readers have a copy of this. His follow up WW1 version of Command Decision called Over the Top also featured a similar approach to the opening moves on the Western front in 1914 called ‘Home before the leaves fall’. A wargames campaign is always a compromise in terms of scale as the size of a collection usually determines the forces available. I always work on the basis that a campaign is a scaled down wargame which is in itself a scaled downed from reality. This ‘telescoping’ is fine and is probably the only way to field representational forces in a meaningful way. 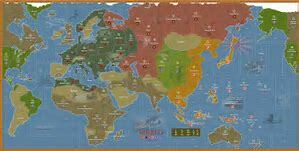 Using Axis and Allies as the basis for a campaign raises a number of challenges. 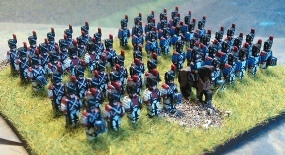 The Infantry figures generally represent whole armies which of course are made up of various troop and equipment types. 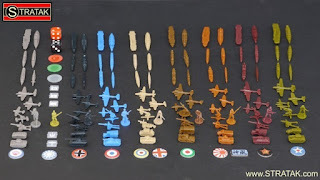 The area of TOEs for formations in WW2 is a veritable minefield as ‘paper’ and ‘actual’ strengths were usually very different, especially when a force had suffered a number of defeats or was short of supplies. This means that mapping across a map unit into a table top force is fraught with difficulty. I am thinking about using a force that is made up of a core of units with some options to add a little variety. The naval and aerial dimension are something else to consider and as yet I have no thoughts about how I will tackle this. The games resulting from the map movement will be tactical but it is the challenge of mapping these forces back to the strategic picture that is where the fun starts. 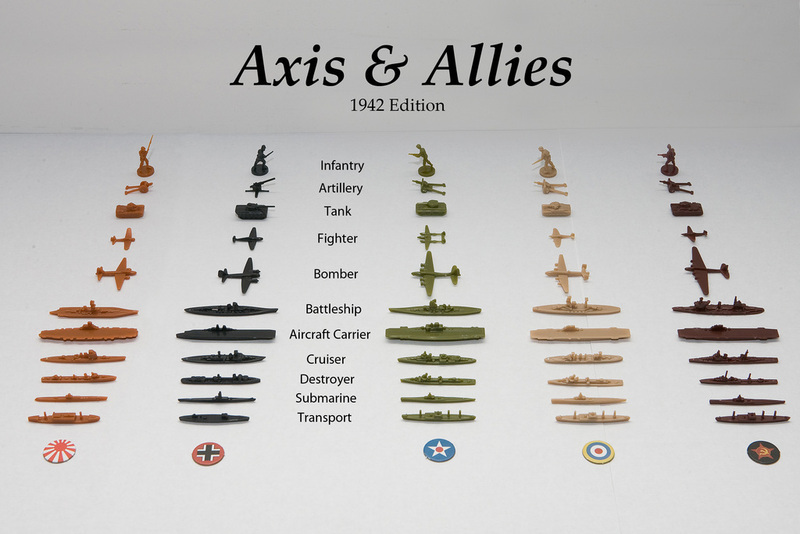 After my post of yesterday I spent some time messing around with basing ideas and considering exactly what I want to achieve by using Axis and Allies game pieces for my WW2 needs. On the face of it the whole idea probably seems a little odd after all, why pay for a game with oddly scaled models that are not as detailed as easily available scale metal miniatures? In truth there are no simple answers to this. I believe that I can produce a good game using the components included - be it land sea or air - and that the overall cost will be more palatable. I am conscious that I have wasted a lot of money over the years on models and if I am honest, the thought of replicating what I am planning on tackling with the game pieces using metal models instead is a financial outlay I am reluctant to embark upon. To illustrate my point for an overall projected expenditure of around £150 I will have fleets, air forces and land assets for five nations - or around £30 a go - and this includes basing etc. My solution also has the advantage of having everything in one place - buy the game and you have all the bits needed. I am only buying a further edition of the game (included in the budget, as are the additional pieces that are not available in the games) simply because the extra material adds to the variety of models as well as bulking out some of the existing ranges. In short it is more wargamer friendly. From a painting perspective these models will be very straightforward to tackle. Given my aversion to this part of our hobby (to be strictly accurate it is my aversion to painting anything 'organic' rather than mechanical!) this is another positive consideration. The ships will be painted in my usual fashion and will feature names and ensigns on the bases and the aircraft will be mounted on flying stands with decals provided by Tumbling Dice. The land stuff I am still pondering over simply because it is an age since I painted anything in this area. In respect of rules, well, anything goes. The Portable Wargame will feature or even straight Memoir 44 although Sam Mustapha's Rommel will make an appearance at some point. 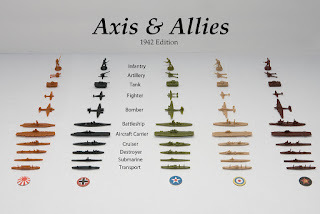 Axis and Allies: Angels 20 will probably be the rules of choice for the aerial stuff whilst for the naval side I could do a lot worse than using good old GQ1 and 2. Mention of the naval side adds a further element in that the models lend themselves to some basic conversions. There is a very good selection of merchantmen and I plan to use some of these as AMCs or possibly commerce raiders. Some of the other ships could also be tweaked slightly so this is another avenue I can explore. There will be plenty of spares to play around with! The game itself is designed ideally for multiple players and it has been described as a 'light' strategy game. this is true and if I am honest I am very unlikely to play this as it should be played. The components are very useful (I mean other than the miniatures) and will be used for a number of ideas I have in mind. The map board is also very handy and could be used quite readily for a global based miniatures mega-campaign. In fact one could argue why not just 'wargameify' the board game itself? Hmmm, turning a perfectly good lightweight strategic level WW2 boardgame into a miniatures based gaming tool? Whoever would have thought it? Rather than show you the same castings but in a different colour plastic I figured it would make more sense just to show you those types unique to each nation. The allies seemed to be the main victim in this as the Fletcher class destroyer appears in the US, USSR and the Royal Navy, likewise the 105mm Howitzer. The Russians also benefit from the Royal Sovereign and an Illustrious class carrier. So without further ado. The great American arsenal of democracy - a Wasp class carrier (methinks it is an Essex class, not the original Wasp), an Iowa class battleship, a B17 and a P38 fighter. The destroyer, submarine, Liberty ship, Sherman and 105mm howitzer appeared in the previous post. From the USSR we have a T34/76, a PE 8 bomber and a YAK fighter - again, the destroyer, submarine, transport and artillery piece are courtesy of the USA. The first of the Germans. A Graf Zeppelin class carrier, Bismarck, a type 34a (Z5) destroyer, a type 7 U Boat and a Danzig transport type. A Ju 88 and Ju 87 Stuka together with a Panther tank and an 88m deployed in this AA configuration. Fortunately there is a 105mm howitzer and a Me 109G in the next set I am getting (Spring 1942). The 1941 set features a Tiger 1 (as well as a JS2) and earlier Panzers are available - as well as shielded 88mm - from the suppliers mentioned in my previous post. For Japan we have the carrier Shinano, the mighty Yamato, a Fubuki class destroyer, an I class submarine and a Hakusan Maru class transport. You can get a Kongo class battle cruiser and an Akagi class carrier separately to expand the selection somewhat. A Betty bomber, a Zero fighter, a type 95 Kyugo light tank and a 70mm howitzer. The tank is quite a nice model and I reckon it could double as a Panzer 38t with a German paint job. The generic AA gun and an industrial complex aka a target. There are a lot of holes with the choice of models but many of these can be addressed. The later sets include a greater variety of pieces and include other nations. 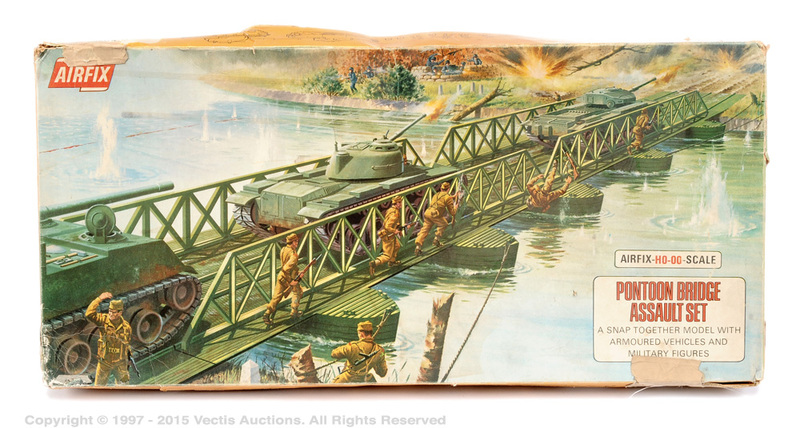 It is possible to get Italian and French models and even the ANZACs get a look in. 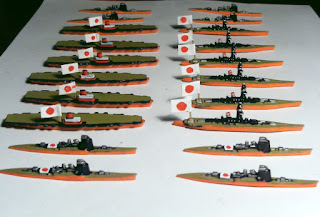 The set I am getting next will give me a lot of extra pieces to bulk out the set I have as well as some new models - cruisers being the main item, not to mention some more nation specific stuff for the British and Germans. Finally, and by way of a little experiment I messed about with some basing ideas during the course of which I compared the land models with the Tumbling Dice 1/600th scale infantry. The base size is 40 x 30mm, the infantry are 1/600th with the Panther for comparison. I must confess that the above has given me a lot to think about as the land models look fine alongside the metal infantry. The base size works well with a strip of the figures or a single vehicle/artillery piece. I may use a dice frame to hold a strength point dice or possibly a small magnet - rather like the system Bob Cordery and others use for Megablitz. The base also fits on a Heroscape tile quite tidily. So once again it is very much a tale that grew in the telling but I am confident I will get a lot of mileage out of this idea. I have finally had a chance to crack open the recently acquired copy of Axis and Allies (2004 revised edition) and so I thought it would be a good idea to share some pictures of the pieces and my thoughts as to how I shall be using them going forwards. The most pleasant surprise though, was the fact that the models are hard plastic and not polythene. They are basic in respect of detail but that will work fine for me. There are some curious choices in the mix for the British (as with the others nations as well) although later editions do address this after a fashion. There are also the additional pieces available from Historical Boardgaming and Stratak which can serve to fill in the gaps where needed. From left to right you have HMS Illustrious, HMS Royal Oak, a US Fletcher class destroyer, a US submarine and a Liberty ship. The ruler gives you a guide as to the size of the models. You can see the variable scaling of the pieces in that the destroyer and submarine are virtually the same size asthe capital ships - which is sure to put off many gamers. I, on the other hand, am not in the least bit bothered by this! I will explain my thinking around this a little later but for now just assume that all is well with my thought processes. I am more concerned by the choice of models in this edition but mercifully this can be addressed by the acquisition of a later version of the base game or buying some additional pieces from the suppliers mentioned. The next set I have my eye on is the Spring 1942 set which not only includes cruisers (a County class for the RN - HMS Kent) for each nationality but the British get their own destroyer in the shape of HMS Saumerez. I would have preferred a J to N type or possibly a Tribal but will make do with what is to hand. From the suppliers mentioned earlier you can get HMS Warspite, HMS Hood and a KGV class in the same notional scale. There is also an Ark Royal. I reckon these are scaled at around 1/600th or thereabouts so I am planning on making use of the decals available from Tumbling Dice in due course. There are a few other types available from the suppliers named - namely a Hurricane, a Mosquito, a Lancaster, an Albacore and a Swordfish. These will go on flying stands in due course for use with standalone aerial games as well as for air support for ground troops or even carrier strikes. 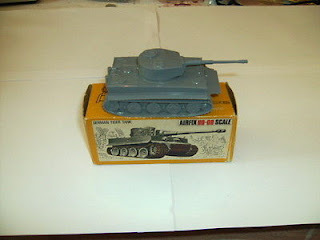 The last pieces for the British in the edition I have are a Sherman tank and a 105mm Howitzer. There are other British pieces available - the Spring 1942 edition has a Valentine tank and a 25pdr - which will also be acquired in due course. From a scale perspective these are roughly 1/300th or 1/285th. For sure these are gaming pieces and not models but they look like what they are supposed to represent. The major types of air, land and naval assets can be acquired from other sets or from the suppliers mentioned. There are significant gaps in the ranges overall but crucially there is enough of a variety to make use of. The edition I acquired has given me sufficient material to make a start on all five nations should I wish. There will be spares - how many R class battleships do you need (especially as the Russians get one as well - HMS Royal Sovereign)? - but these can be used for conversions or imagi-nation type set ups. From a cost perspective the set I acquired was very good value (£30 all in) and you would not be able to buy the material included for less than double that I should think - the aircraft alone would cost around £30 from Tumbling Dice and the hundred odd vehicles/artillery at roughly 50p a go comes out at £50. Then of course there are the ships. This approach will not suit everyone but it absolutely ticks a lot of boxes for me! Last Saturday a small brown envelope dropped through my letterbox from the HMRC. I was not expecting this so imagine my surprise when I opened it to see the notification date of when I can retire and take the state element of my pension. The 28th of March 2026 to be exact. I must confess that it came as a little bit of a shock - I don't know why as I shall be 58 this year so retirement is not exactly an unknown quantity that is steadily looming over the horizon - as seeing it in black and white and officially means that it is on its way. It made me feel a little uneasy and, to be honest, disappointed as I still feel as though I have things to do and contributions to make before the day - so best I get motivated then! 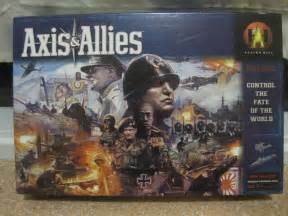 In pursuit of some bits and pieces I need to support my block armies for 20th century gaming I have managed to source a cheap copy of Axis and Allies. The version I have acquired is the 2004 revised edition which was the last produced before the range exploded into a number of other versions. I am really excited about this as the game is unplayed and all the component pieces are still in their packs. Aside from the land bits and pieces there are also the ships and aircraft to consider. I am looking forward to working with these and already have a few simple rules ideas to play around with. The ships and aircraft will be painted and based and for the latter I shall also make use of some decals. This will add to the flavour. Aircraft will also be mounted of ‘flying’ bases. The overall ‘generic-ness’ of the models is fairly muted so whilst they are pretty nondescript detail-wise they can be readily identified as to what they are supposed to be. Again, this will add to the flavour. I have also been looking long and hard at the offerings from the two companies mentioned in my previous posts – Historical Boardgaming and Stratak – and will probably expand the Axis and Allies pieces to include some of these in due course. In many ways there are elements of ‘going back to my roots’ in this latest adventure as making use of materials for purposes other than that for which they were intended used to be very much my stock in trade in the early days of my wargaming. It was a lot of fun and the games I had were real enough to me at the time. Using my block armies over the last few years has reinforced the values I had long since discarded – improvisation and making the best of what you could find - and has made me look at my wargames from a wider perspective. Well certainly wider than painting great numbers of figures at the very least. I have the utmost respect and admiration for those that choose this approach – it just isn’t for me. Having said that I shall not be entirely removed from the whole figure thing as I shall be using those that come as gaming pieces where I am able, for example the Medieval and 18th Century Risk figures at some point. The infantry figures in Axis and Allies may even get a lick of paint, similarly those from Memoir 44/Battle Cry. Of course I also have the 54mm Foreign Legion and Arabs to tackle in due course so I am not really severing all my links with the world of painted figures. There is now no urgency around painting these though which means I can do them when the mood takes me and not to any timetable. I fully intend to paint the pieces that I use alongside the block armies though as, and I can almost hear the mocking laughter in the background, the look of the thing is important to me – this is primarily why I prefer the 3D terrain option rather than using a map. Using varying scales of model within the same game is not a problem - there are rules around that happily do this - so I can take comfort from the fact that all I am doing is standing on the shoulders of giants so to speak. I am experiencing that circular kind of feeling, you know, that Deja vu kind of thing. Way back in the early 1970s when I first dabbled in wargames my resources were very limited. My family circumstances were very modest and money was never plentiful. My mother was bringing up three of us on her own with yours truly being the eldest so hobby 'stuff' was low on the list of our budgetary requirements.. Figures and models were rarities and limited to birthday presents and Christmas, with the odd acquisition as the result of my paper round. The Isle of Sheppey, located in the Thames estuary(where I come from), did not have a model shop although there were a couple of toy shops that stocked Airfix kits and figures, not to mention a gift shop at Leysdown that did the same. The nearest model shops were on the mainland at Sittingbourne. The only magazine I was aware of was Military Modelling and so I used to buy that when I could. In order to wargame then I needed to eke out my finances and make do with what I had to hand. In short, I needed to improvise. I can remember using Lego bricks as troop blocks and scratchbuilding tanks and buildings for my games from a combination . The results may not have won any awards but they served a purpose. In the games I fought they were real enough. The release of the Airfix polythene vehicle range was a major boon for my WW2 games – even if the range was initially a little odd. I happily used vehicles as whatever was needed so the Patton tank served in most armies until the Tiger and the T34 made an appearance. The SP was used by everyone and the 25pdr with tractor was used for pretty much any type of towed artillery or anti-tank gun. I never used the tank transporter or the landing craft though. The point I am trying to make is that I was happy enough using models for things other than what they were as I had little choice. Did the games suffer for this? Absolutely not! In fact it was quite handy as it meant that a particular vehicle could serve in any army – rather like Hollywood in a way. I was reminded of this when I recently watched The Battle of the Bulge for the umpteenth time - M48s as King Tigers anyone? Gradually as the finances improved through a variety of pocket money jobs and so I was able to add into the mix some ‘proper’ models and other equipment. Sadly this came at a price as with this new found ‘maturity’ came the gradual descent into 1980s ‘rivet counting’ rules. Fast forward to the present day and after I have divested myself of my rose-tinted spectacles I find myself on the brink of doing something vaguely similar but with the benefit of over 40 odd years of wargaming ‘experience’. I have abandoned the rivet counting of yesteryear and so for my 20th century games I will use the blocks and make do with what models I can get to use alongside them. This would not work for many people but suits me to a tee as I generally fight most of my games on a solo basis. It will also make battle reports a little easier on the eye. It does not mean I am abandoning figures and models entirely – it is just that in order to satisfy a certain requirement this is the solution I shall adopt. 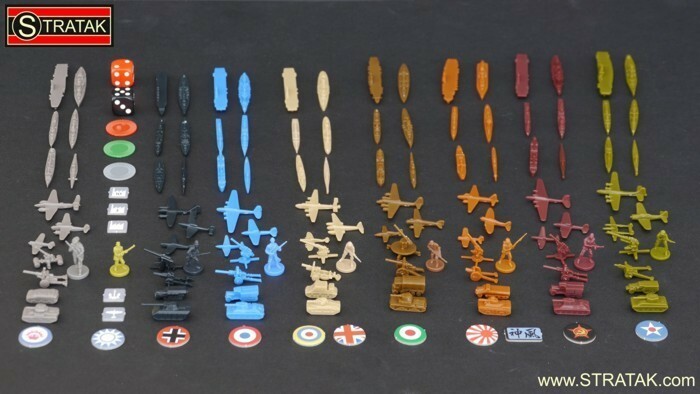 The pieces included in the Axis and Allies series of games also feature a number of ships. Each of the major powers fields a carrier, a battleship, a cruiser, a destroyer, a submarine and a merchantman. These are not consistent in terms of scale but are quite obvious as to what they represent. There also a number of nation specific types available from a couple of suppliers which are useful to fill some gaps in the range. In fact one could build up a navy with the 'correct' ships being used as intended via these suppliers if desired as long as one bears in mind they are not scaled in anyway but are designed as gaming pieces. Another supplier of gaming pieces for use with Axis and Allies - the website is on the pictures should you want to take a quick look. If I am honest with myself I believe that I have been pursuing a wargaming blind alley for years now. I am unlikely to paint great armies of figures - it has little appeal to me for a variety of reasons - or huge fleets of ships (I have tried both) and it many ways this has held me back from my enjoyment of fighting wargames. I do not believe you need to use figures or models to have a good wargame - all you need is a little imagination and a gaming medium that works for you. I want to fight table top battles using whatever I need to - be it detailed models, cardboard counters, wooden blocks or gaming pieces with the proviso that if any models are used then they should be painted. The same table ready to pack away as the legs are not fixed - they merely slot into the corners on the underside when fully extended. The table currently lives down the side of the freezer in the utility room! Many years ago - by my reckoning at least ten - I acquired the above table from a boot sale for the princely sum of two pounds. It was had been built by the chap I purchased it from and was originally designed to be used as a card table. It had been covered in green baize that was very tatty around the edges so I duly removed this and recovered it with a model railway sticky backed grass mat from a model shop. I had always intended to use this for wargames but for some reason never got around to doing so. The table has however, seen a lot of action as it is the family gaming table so comes out for cards and boardgames at Christmas whilst SWMBO and I use it for our occasional Scrabble battles. Using blocks on a free table - not a grid in sight! One of the main reasons I went to the trouble of making my block armies was to enable me to fight games covering a variety of periods without having to invest time and money in multiple ranges of figures. I am an avid student of military history but a reluctant painter of figures so tackling new periods would usually mean a lot of time and effort which is frankly beyond my fickle nature. The blocks were successful without a doubt and fulfilled their intended use beyond my expectations. They are not perfect by any means - I am quite sure someone who is a better with graphic design software than I could produce far more readily attractive labels - but they hit the spot for my needs. 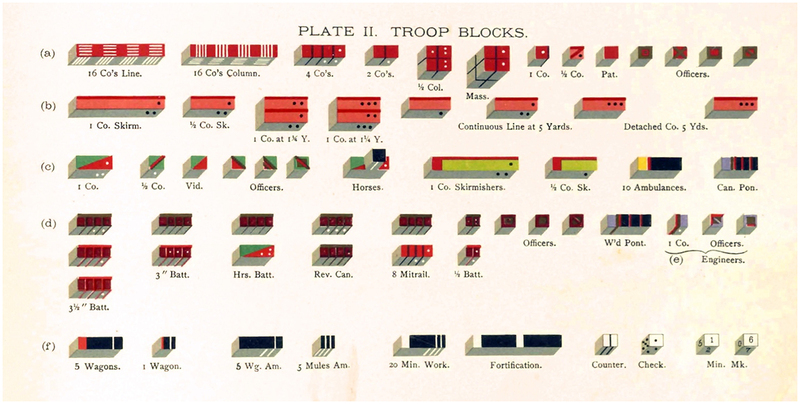 Traditionally Kriegspiel blocks would be used on a two dimensional basis using a map or a hand drawn layout. Indeed, I have received suggestions along the lines of using board game terrain tiles for my games on a flat playing area - a good idea but not quite what I want to do. If you look at the top picture you will see a game that someone has set up using troop blocks and three dimensional terrain on a normal playing area - essentially off the grid so to speak. I really liked the clean lines of this approach and the terrain gelled with the use of the blocks in a very pleasing way. Mind you, I also rather liked the action being fought in the bottom picture as well. I believe that by using a careful selection of representative terrain - I am thinking of the 'Town in a Bag' buildings or my holiday collection of Greek buildings - I am thinking that my games will capture that all important '3D Map' look I am aiming for. It will also mean that I can use a far greater selection of rules than currently as everything I have been gaming has tended to be Command and Colours or Portable Wargaming based. I intend conducting a few experiments using my block armies 'off the grid' so to speak and will be exploring using blocks on a map and also with 3D terrain to see how they look. 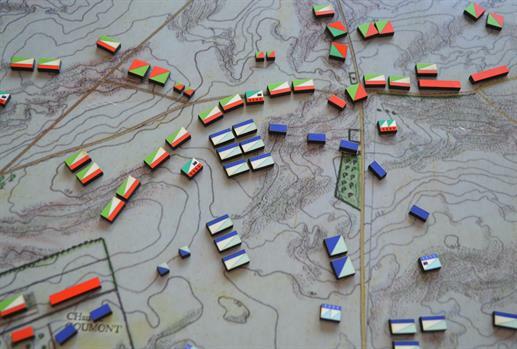 I will also be drawing maps to fight over and this will certainly take me back to my early days of wargaming. The hand drawn maps though will certainly have an advantage in terms of practicality as they will be very easy to store and will be instantly reusable. I came across something rather novel being produced by a company called Commission Figurines which, inevitably, got me thinking. Essentially, as well as a very nice selection of terrain pieces the company have launched a range of 6mm MDF figures. That’s right – MDF. At present Napoleonics and ACW are available and the first of an Ancient range is being launched. These are quite intriguing to look at and certainly give the whole ‘wooden poses’ concept some mileage. Presumably due to limitations of production the figures are fairly static looking but that rather adds to the charm in an old fashioned way. The figures are laser cut from 2mm thick MDF and have detail etched into the surface of the figure which adds to the ease of painting. These are for all intents and purposes ‘flats’ and therefore are a whole lot easier to get ready for action (no offence intended for the ‘flat’ painters amongst us….). The poses are quite rigid which works well for certain periods, in fact they put me in mind of the Histoire and Collections uniform plates. Cost wise they are fairly cheap - £2 will get you around 96 foot including command, 30 odd mounted or 6 guns and crews with limbers. Curiosity has gotten the better of me and so I have placed a small order for some, just to see how they paint up. The thought crossed my mind that you may well be able to get away with a black wash undercoat and then blocking in colours with ink or paint pens rather than using a brush. En masse they look pretty impressive and I believe a review appeared in the January edition of Wargames Illustrated. Yesterday, January 5th 2018, we said farewell to Eric Knowles. The funeral took place in the Holy Trinity Church at Tattershall, a short walk from where Eric and wife Ivy had retired to in Coningsby, Lincolnshire. My travelling companion for the day was John Abbott, a former denizen of the Newham Wargames Club and, as I found out during our six hours on the road, responsible for painting a rather large amount of figures for Eric for the famous Madasahatta campaign. I have known John for almost as long as Chris, Neil, Dave and a host of others from the late 70s and early 80s and we crossed swords over the gaming table on a number of occasions - primarily fighting ancients using WRG 6th edition (of which John was an avid fan). I must confess that I have never driven further north than Norwich so this was going to be an adventure and no mistake. I should point out that I am a non Sat Nav driver and prefer to navigate by that rather old fashioned method of using a map. I was however very fortunate in that John is far more technologically inclined than I am and so we made use of an app on his phone for the trickiest final part of the journey. John is very talkative and quite forthright in his opinions and I value his insight immensely. We shared many memories of the club and Eric and the impact him and Ivy had on our respective lives. It was all to the good and for me anyway, almost a cathartic experience. They say that true friends can be apart for years and when they do eventually meet up it is like no time has passed at all. It was certainly the case with John! We arrived at Tattershall a good hour and a half before the service was due to start so opted to have something to eat beforehand. John very generously purchased a very nice lunch (there seemed to be no shortage of rather charming looking inns in the area - no doubt the close proximity to an air base may have something to do with it!) and we continued with our respective reminiscing of Eric and the old Newham days. We arrived at the house of Eric’s daughter, Alex, in time to meet with Bill (his son and a former gamer from the Newham days) and the rest of Eric and Ivy’s close family. Alex’s house reminded me of the old haunt in Seven Kings where we had so many Wednesday evening games as it is a homely jumble of Knick-knacks, pictures, strange ornaments and endless cups and mugs of tea. The kind of welcoming place you immediately feel at home in, unpretentious and without ceremony. I had not seen Alec for some thirty years or so but she was just as I remembered her from the old days. The funeral was in three parts. Firstly there was a service at the Holy Trinity Church which was simple yet moving. There was no fuss or flam and paradiddle - although the organist dropped a few notes (I could imagine Eric having a good chuckle at that - his sense of humour could best be described as irreverent....) - but their were a number of very appropriate touches. As a long serving guide to the Battle of Britain Memorial Flight Eric was accorded a guard of honour by the fellow volunteers and received a fitting eulogy from Squadron Leader Ian Smith from his days when he commanded the Battle Of Britain Memorial Flight. ‘Smithy’ (as he is known) was able to describe many things about Eric and his life as well a number of amusing anecdotes of his time as a guide in the BBMF. He cheerfully acknowledged the fact that EVERYONE knew was really in charge....I also learned about some of Eric’s war service in the Far East which served as a poignant reminder of not only the debt we owe those of his generation but also of the cost they themselves bore. The second part of the service was at Boston crematorium and this was originally intended to be for family only. Bill extended the signal honour to both John and I of insisting that we came along as being old and longtime family friends. It was a touching gesture and one that we both appreciated. The service and commital was brief - I should mention that the music we entered by was ‘A modern Major General’ as Eric was a great fan of Gilbert and Sullivan which seemed hugely appropriate. It certainly raised a smile. After the commital we headed off to a local hostelry for the wake. The whole thing went well and in truth it really was a celebration of Eric’s life - it was not noticeably sad and everyone had an amusing anecdote or two to tell. His was a full life and I, like many others I know, consider ourselves fortunate to have been even a small part of it. It was a long day and a tiring one but both John and I were honoured and proud to have been a part of Eric’s send off. Our grateful thanks to Bill and the family for allowing us to be a part of the day and my personal thanks to John for his technical ability with an IPhone Sat Nav! 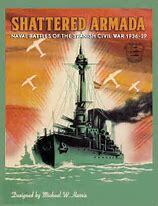 Not a full set of rules but a supplement including scenarios and ship and aircraft specifications etc. I seemed to spend a lot of time making assorted Lego Star Wars models with my grandson as well as watching the Last Jedi and visiting Norfolk for the new year. I cannot say it was relaxing but what it lacked in repose it more than made up for in family fun. On the prezzie front I did rather well and so an ITunes gift card, an Amazon gift card and a copy of the Osprey hardback Hitler's Armies all featured - I am sure you are not interested in the socks, aftershaves or assorted toiletries I received as well. I have downloaded The soundtrack to Last Jedi and the film Barry Lyndon courtesy of ITunes and picked up a copy of '45 - a military history of the last Jacobite rebellion by Stuart Reid and also ordered a copy of La Ultima Cruzada by Bob Cordery. There are a couple of themes surfacing here which I shall expand on. The recent passing of Eric Knowles has affected me rather more than I would have expected. To be honest I have not seen him for some 30 years but he, and his wife Ivy were instrumental in getting me to join the Newham Wargames club and pretty much most of my life after leaving the Isle of Sheppey at the age of 17 when I moved to London started from that point. Lifelong friends and indirectly my wife all stemmed from that place and time. I know that all sounds very melodramatic but that is the truth of it. My enduring interest in naval wargames, the 18th century (admittedly on a ‘low light’ so to speak – mainly due to the painting required and my well known aversion to it…. ), WW1 ‘sideshows’ via Madasahatta and of course, the Ottoman Turks are all testimony to Eric’s enthusiasm, knowledge and encouragement tempered with a delivery that only an ex NCO can achieve…. So, along with Barry Lyndon (and I can still remember Eric talking us through the battle scenes) I had previously acquired Rob Roy, The Last of the Mohicans and The Patriot. I think my IPad is going to be busy again. 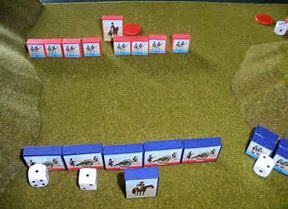 The 18th century games we used to fight used a cut down version of Charge! or more latterly a set called Frederick the Great. The cut down version of Charge! used half size units and Frederick the Great halved them again so infantry battalions ended up around 14 figures. Our 18th century games based on the Seven Years War in Europe so my interest in the wars in America and India really followed on from the Eric years but for sure the seed was definitely planted on the table top clashes of Rossbach, Minden and others. 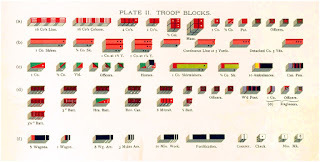 I have no idea as to how I would game these wars - the blocks offer a good alternative to figures - but suspect that my collection of fairly generic 18th century plastic Risk figures may yet see the light of day a la Kaptain Kobold and his Great Northern War armies. Mention of La Ultima Cruzada leads me quite nicely into the acquisition you see above. I have long had an interest in the Spanish Civil War and rather fancied the naval side if only because of the vast difference in the two sides from a technical and competence perspective. Uneven sides make for better games in my experience so this should be a fun exercise. The number of models needed will not be many and 1/3000th will be the scale of choice with 1/600th scale aircraft where needed. Navwar produce all the ships I would need and let us not forget we can also include some Germans, Italians, the Royal Navy and France as well. Tumbling Dice produce aircraft for the period so it can be quite a tidy and self contained project. The one thing I should have taken from Eric - and I am very conscious of my failings in this regard - is the old concept of focus. I am not in the habit of making new year resolutions but reckon that perhaps I should. How about 'sticking to the plan' for one?